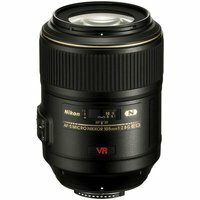 The Nikon AF-S 105mm f/2.8G VR IF-ED Micro lens is the first macro lens to include VR, utilising Nikon's second-generation vibration reduction system to allow flexible hand-held shooting. It features the SWM (Silent Wave Motor) and IF (Internal Focusing) to ensure quiet autofocusing. Optical performance is enhanced by an ED (Extra-low Dispersion) glass element that minimises chromatic aberration.